October 17, 2016 found us moving west to Tucumcari, NM. This move gave us a time change, so arrival at the Mountain Road RV Park was an hour earlier than we expected. We pulled into our spot and put the leveling jacks down and then realized that our living room slide was going to hit tree limbs, not wanting to rip the awning we had to move. When we went to move the RV the leveling jacks wouldn't go up. Finally got them up enough to drive around the park once again and pull in correctly. The entire campground is gravel and sand, the sites are very close together and just long enough for the RV and parking the car. We paid $175.00 which is the weekly rate. WiFi was spotty but our Verizon signal was strong. The laundry room and bathrooms were clean. Once we got the RV in the right spot, Nancy started on the inside set up and as she has warned before in a tip, you should always be careful when opening doors after a move. A plastic cereal box fell out of the cupboard. It cracked and the lid fell off when it hit the counter, Rice Krispies everywhere. She wanted to cry until the air was filled with the sound of snap-crackle and pop all around her, which made her bust out laughing. 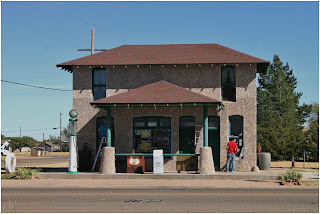 From this stop we traveled Route 66 from Vega, TX to Santa Fe, NM. Most of the towns have very little left of the old Route, in fact most of the old road is gone. We drove through town after town of abandoned buildings and stretches of nothing but countryside. It's hard to imagine what it was like back in the 20's - 40's. A majority of the road back then was not paved, so there was dirt roads with many ruts. The cars didn't drive as fast as we do today, there was no air conditioning and many cars had no heat. 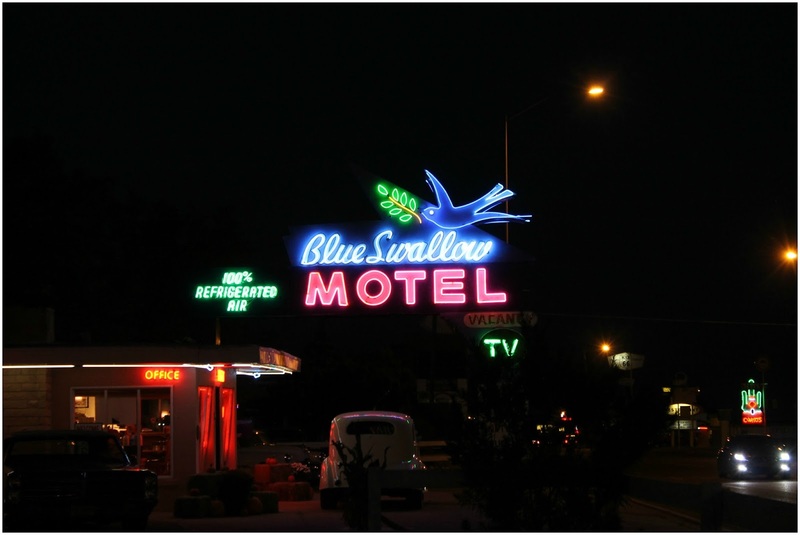 One can only imagine the relief they felt when they hit a town with gas stations and motels. Many slept in tents or their cars as they traveled. We have read and heard stories of roads washing out and travelers being stranded, it sometimes took days for help to come. Today we get irritated if roadside assistance takes 45-minutes! 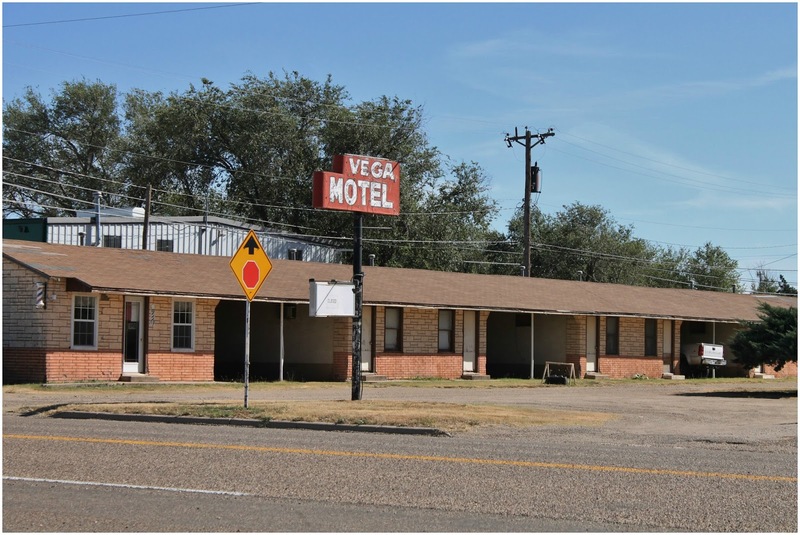 Vega, TX still has a little life in it. There are a few antique stores and there is work happening at the old Magnolia Gas Station, so it looks like another business may be going in. All along the route we have seen so many old cars, some restored and others left to rust. 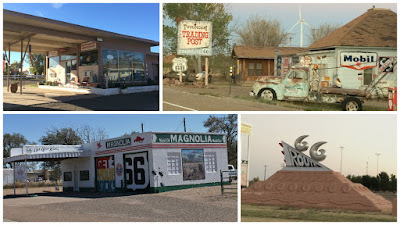 Many have been adorned with cartoon eyes due to the movie "Cars", which is based on this section of Route 66. Murals are another thing we have seen a lot of. The Vega Motel is still in operation and like many others it has carports for each room. 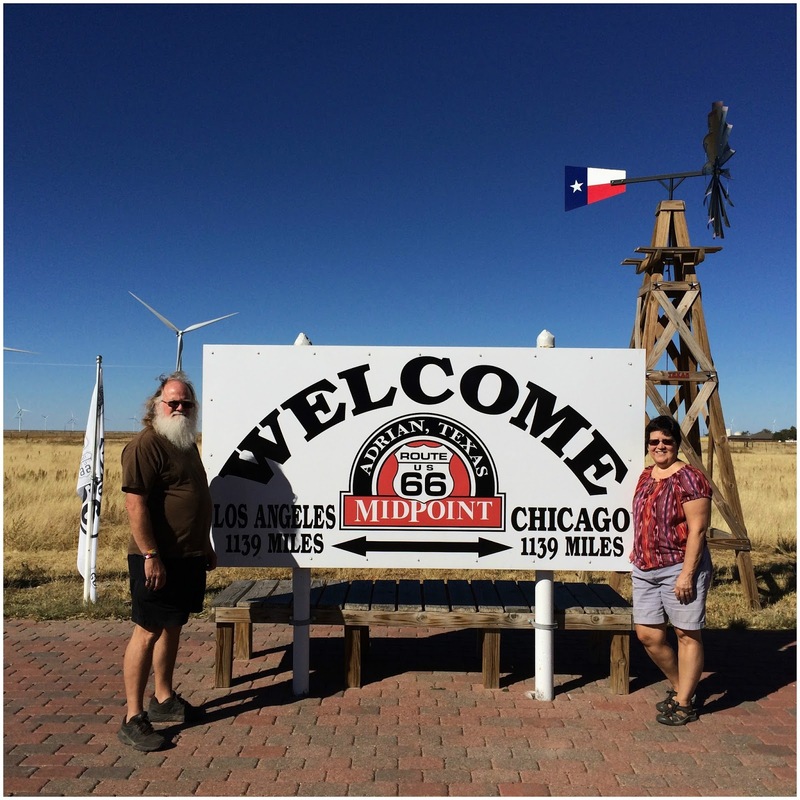 Adrian, TX is the midway point on the route. It is 1,139 miles to Chicago and 1,139 miles to Las Angeles. 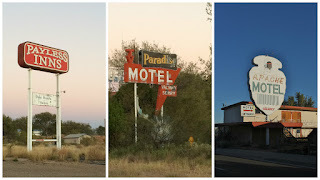 The only thing left in this town is the Midway Cafe and the photo opp sign. Three people who are biking the route, yes you read that correctly they are biking it, were also stopped here. There is a couple from Germany and a young man from Japan, who took our picture for us. 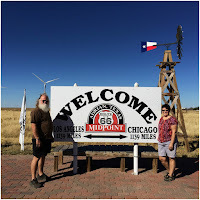 We met the couple back in Chandler, OK as they camped at the same place we were at. The Midway Cafe is known for it's homemade pies so we enjoyed some for Les's birthday. They were as delicious as claimed. 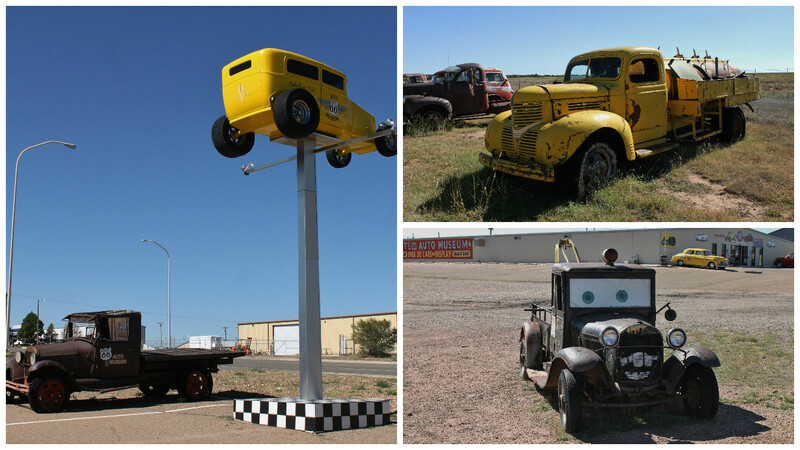 Glenrio, NM sits on the boarder of Texas and New Mexico and its claim to fame is Russell's Truck Stop and Car Museum. This place was great. They have a nice sit down restaurant along with fast food. The best part is the car museum, it is free and loaded with cars and memorabilia. There is nothing else in this town, we didn't even see houses. 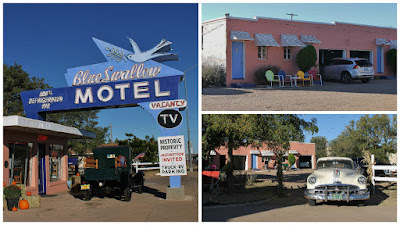 There are a few old abandoned buildings like the Western Motel. Tucumcari, NM is filled with Route 66 history. 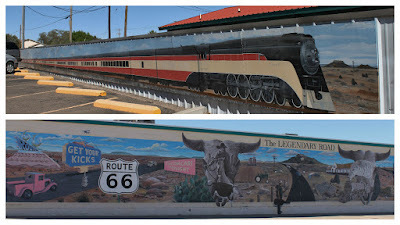 The town had a reputation for being a rowdy western town with wild saloons and outlaws that earned it the nickname "Six Shooter Siding". It was used in the TV show "Rawhide". 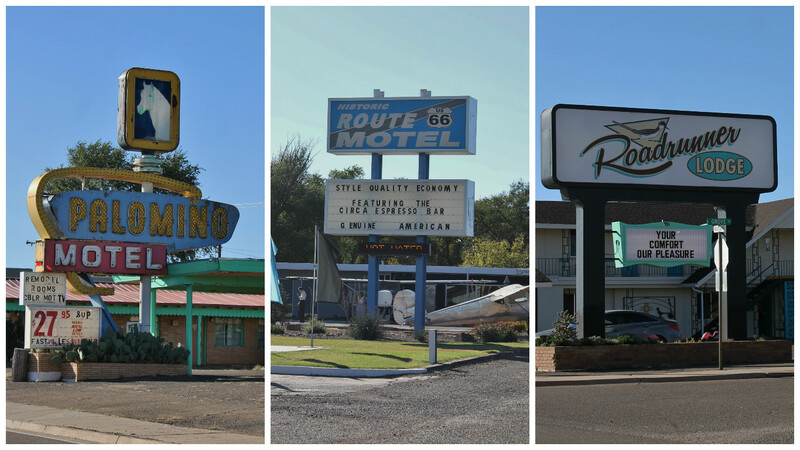 In the heyday of Route 66, the town had 2,000 motel rooms, today only a fraction of those remain. 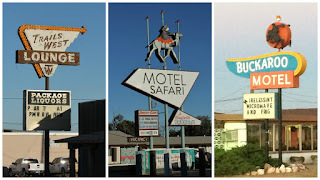 There are some wonderful old signs and buildings. 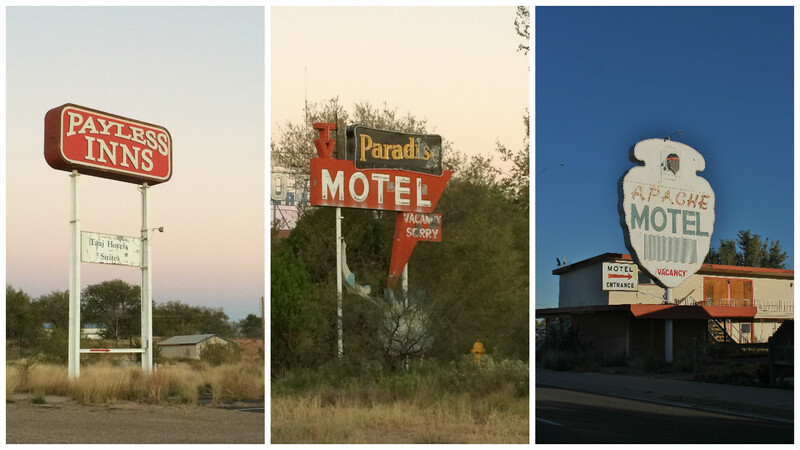 Many of the signs stand in front of empty lots or abandoned buildings. 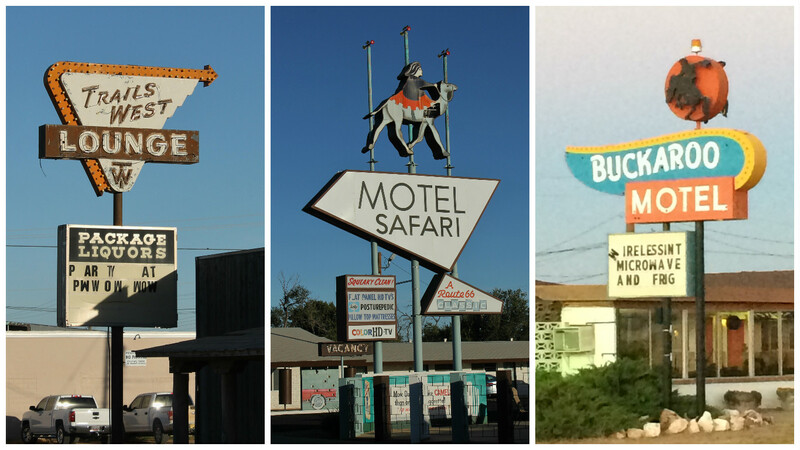 The Motel Safari, with each room decorated differently and the Buckaroo Motel are still in operation. 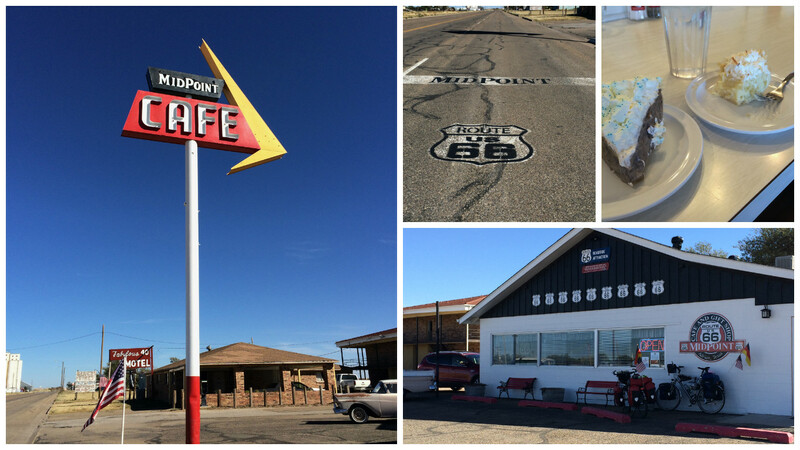 The Palomino, Route 66 Motel and the Roadrunner Lodge are also up and running. Some have used the routes history to create a fun place others look like they are just hanging on. The Blue Swallow is probably the best one in town, a few of the carports have murals of cars painted in them, they have small park like sitting areas and old cars surround the office. The sign at night is pretty cool. A number of the old gas station buildings have been turned into other businesses. Trading stores, the Visitor Center and even an exterminating business. 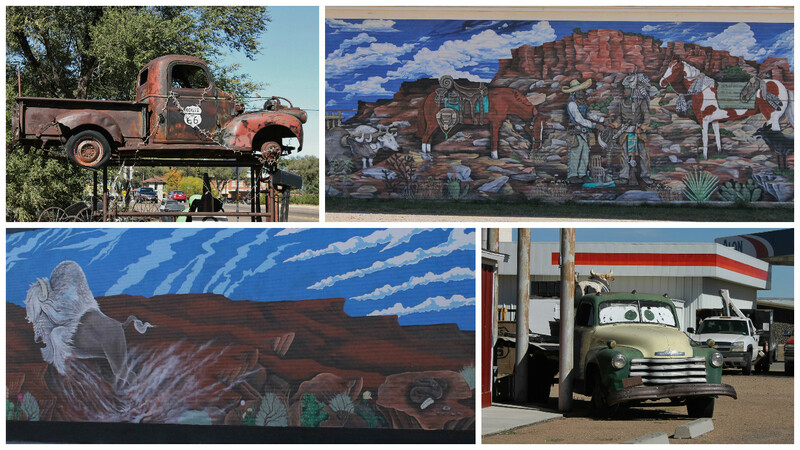 There are 40 murals all over town, large to small. We picked up a map at the Chamber of Commerce and went exploring. 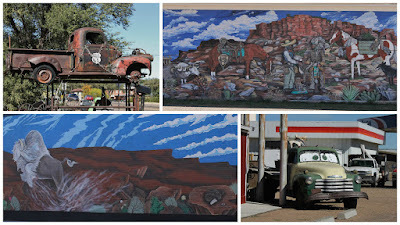 They depict the history of the area from the wild west to Route 66. 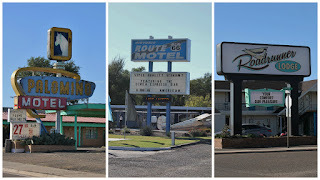 The drive from Tucumcari to Santa Rosa takes you through small, almost ghost towns, portion of the old road is rough in spots and you have to get on I-40 to finish the rest of the trip as the road disappears. On the way you pass beautiful scenery of red rocks and small rivers. 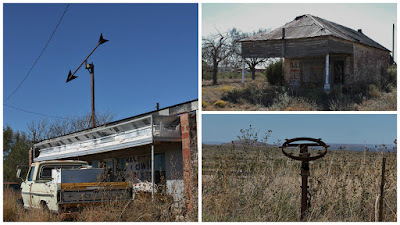 In Newkirk, NM there are a number of abandoned buildings and interesting metal pieces. 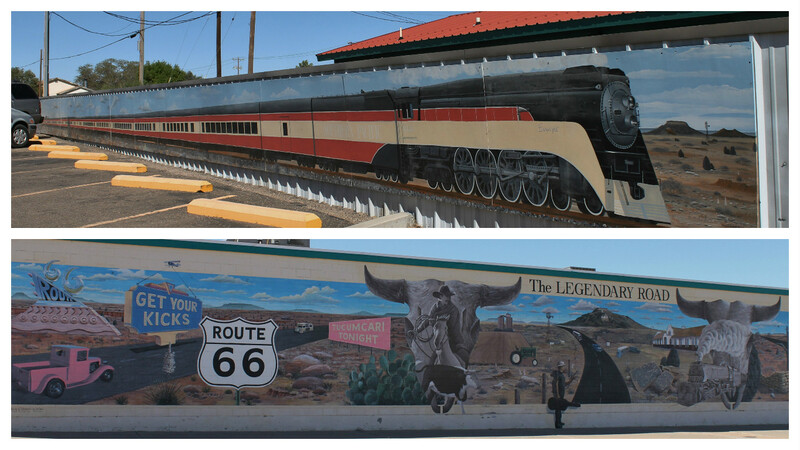 In Santa Rosa, NM you can enjoy history and the great outdoors. It is called the "City of Natural Lakes" as it has a number of under ground water tunnels that have created lakes and an artesian fed watering hole. The Blue Hole is 81-feet deep with a diameter of 60-feet. The outflow is 3,000-gallons per minute and the water-temp is a cool 61-degrees. It is such a beautiful spot and the water is so clear. 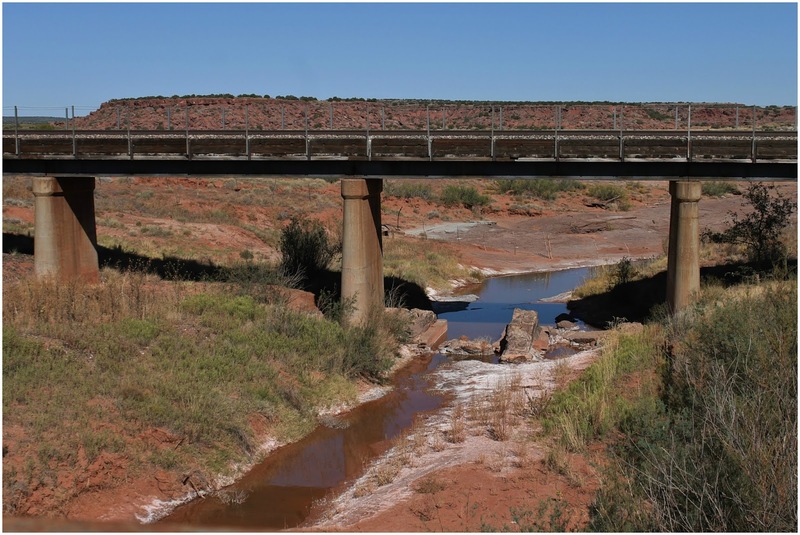 It is one of the best natural swimming holes in the state and it is the scuba diving capitol of the southwest. There were two divers the day we were there. 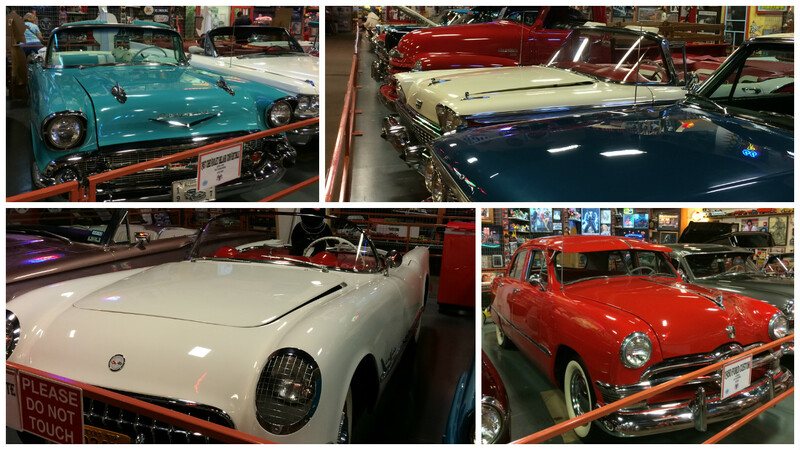 For indoor fun we went to the Route 66 Car Museum. 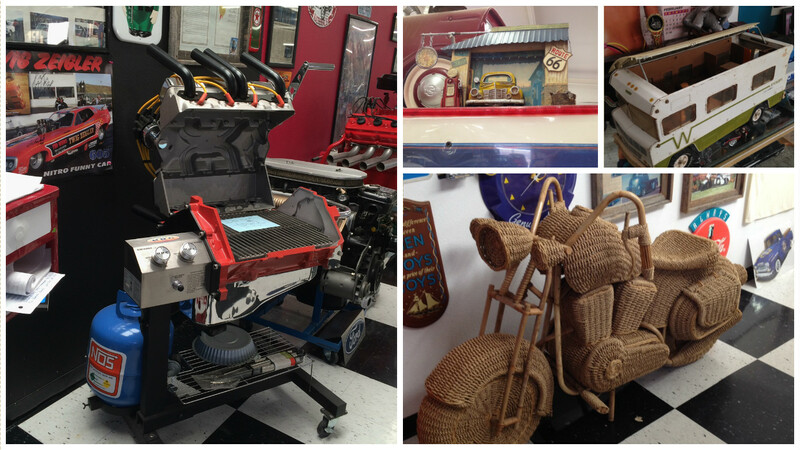 It is loaded with beautiful old cars and lots and lots of memorabilia and old toys. The Sun and Sand Motel is still a thriving business, the Sahara not so much. There are two directions you can go from Santa Rosa. 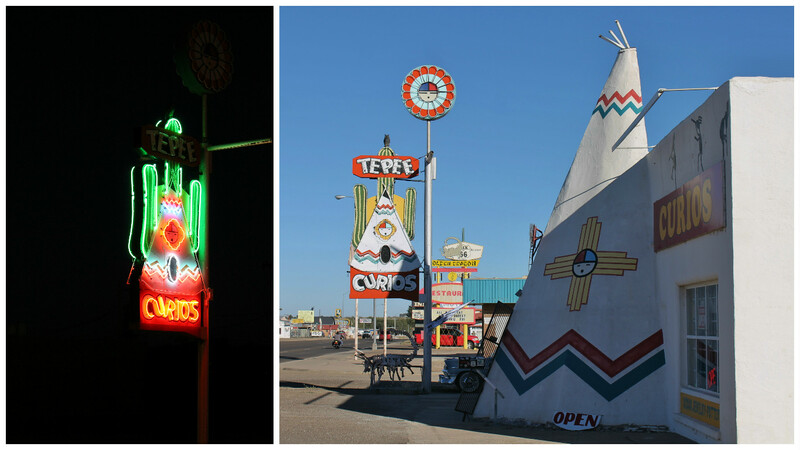 The pre-1937 alignment travels north to Santa Fe, or the later route that takes you west on I-40 into Albuquerque. We took the north road to Santa Fe. Along the way we made a stop at the Pecos National Historical Park. It features ruins from an ancient Pueblo that dates to AD 800. There is a 1.5-mile trail that takes you through the area, due to time we took the short 1/2-mile loop and got to explore the ruins of the Mission. The entire trail is asphalt. The first ruins you come to are the wall that surrounds the South Pueblo. It is the Pueblo of the people of Pecos. The name means "the place where there is water." In its heyday there were perhaps 2,000 people living in this village. Outside the brick wall (center picture) is a large field that was a trading place for the Plains Apaches. The ruins were once multi-storied homes with families occupying all the levels. 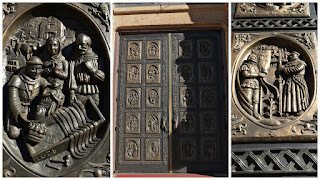 The Spaniards arrived in 1540 and of course wanted to convert the Pecos people to Christianity. As in other cases it didn't go all that well. The first Mission was built in 1625 and the foundation of that one is underneath this Mission that was completed in 1717. The first Mission was destroyed in the Pecos rebellion in 1680. Pecos across the region united and drove the Spaniards out of New Mexico and regained their freedom, but it was short lived. There are two Ceremonial Rooms, or Kiva's that you can enter. One in the South Pueblo community and one on the Mission grounds. Entrance was through a hole in the roof and you climbed down a ladder. Rituals were performed here to insure the well-being of the people. 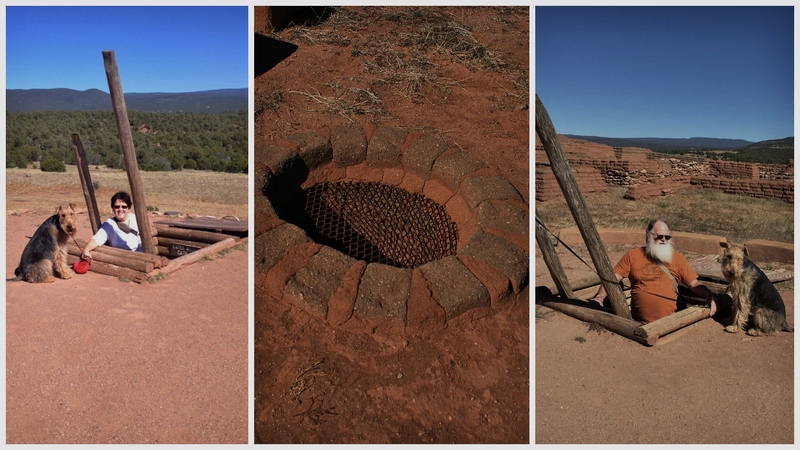 Each kiva society conducted different ceremonies, for successful hunts, or to cure the sick were two. The room was also used by the men to weave the kilts and sashes worn by the dancers. 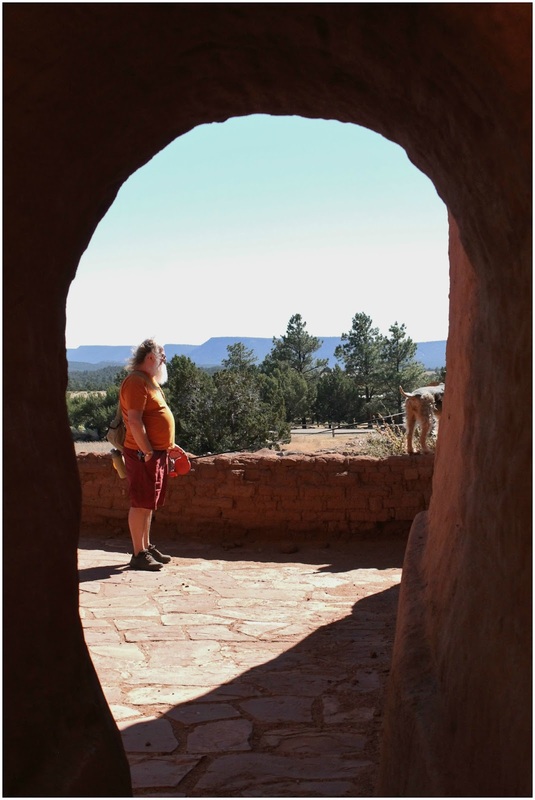 There were 20 kivas found at this site. They shared some common features, entry through the roof which also served as the chimney, a ventilator shaft for fresh air, and a fire pit. As we headed to Santa Fe, we came across the bikers from Germany again, this road climbs 7,500-feet to the Glorieta Pass. So glad we were in the car and not on bikes. 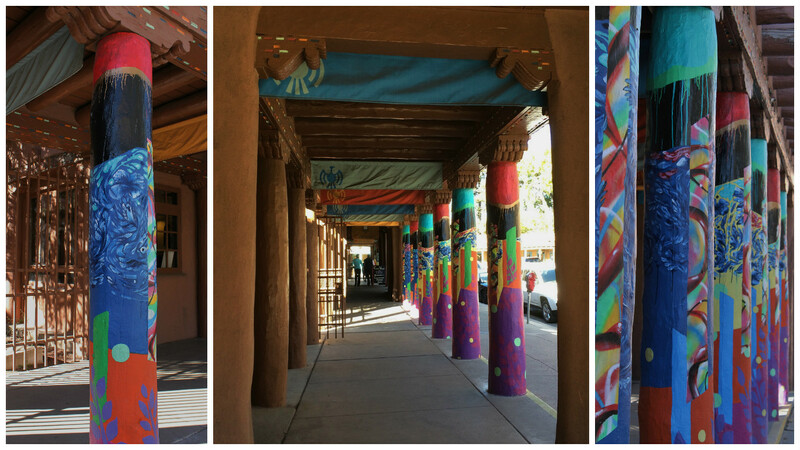 Santa Fe is a bustling town with many places to eat and shop. The Plaza is a park in the center of town, where we found a dance troupe performing. 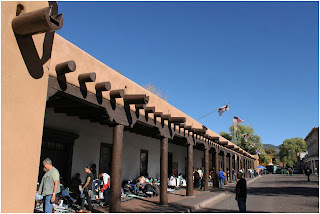 One side of the park is the Palace of the Governors, the oldest continually occupied public building in the U.S. It predates the White House by 200 years. Built in 1610 it served as the seat of government for Spain's northern most colony. The front walkway is lined with vendors selling beautiful jewelry and pottery. On another side of the park is the Cathedral Basilica of Saint Francis of Assisi, dedicated in 1887. 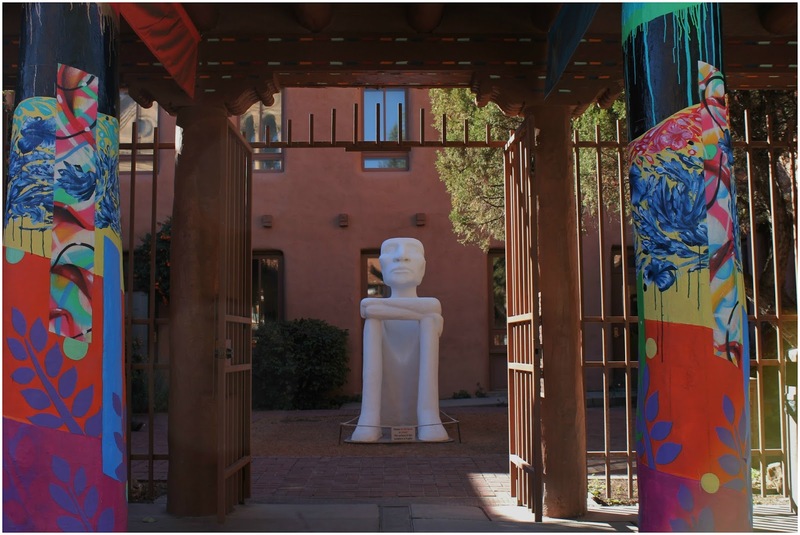 It replaced a smaller church that was destroyed in the 1680 Pueblo revolt. It is a beautiful church inside and out. The Museum of Contemporary Native Art has the best walkway. The poles are vivid abstract paintings done by artist Yatika Starr-Fields. They are inspired by the graffiti culture and the movement in nature. 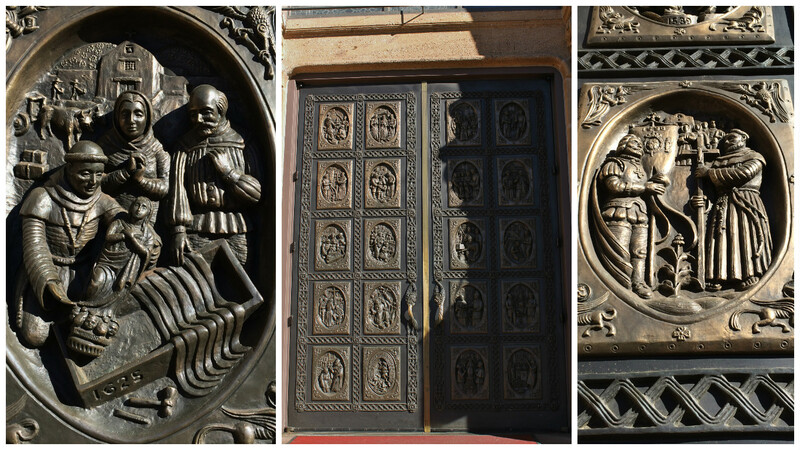 You can see some of the sculptures from outside the gates. 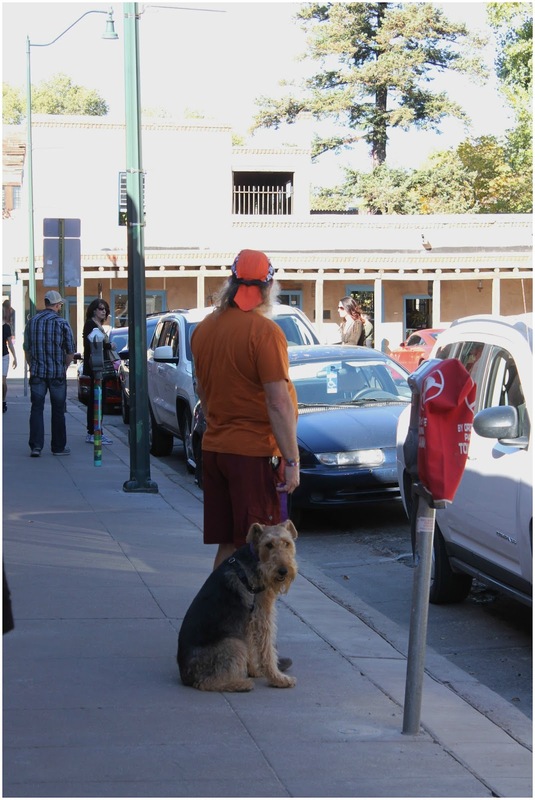 This is a common stance for Les and Mielikki, waiting on Nancy to finish taking pictures. The oldest house in the US is in Santa Fe, it is an adobe structure believed to be built in the 1620's or 30's. 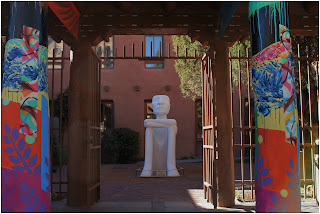 There will be more from Santa Fe in the next blog post as we will continue to explore it from our Albuquerque stop. That is probably the most used words we speak! While there are times we go into a place blind that doesn't happen very often. We research and plan out each stop before we get there. There are many ways to do this. 1. The old fashion way. Les starts with a real map, a Rand McNally. He figures out what is 200 miles from where we are and we start there. Les searches on the Good Sam and Passport America sites. Then he checks reviews on RVreviews, and Google. Nancy looks for day trips. She starts with a google search of "Things to do in ____". She checks out Trip Adviser and Yelp not only for things to do but reviews as well. 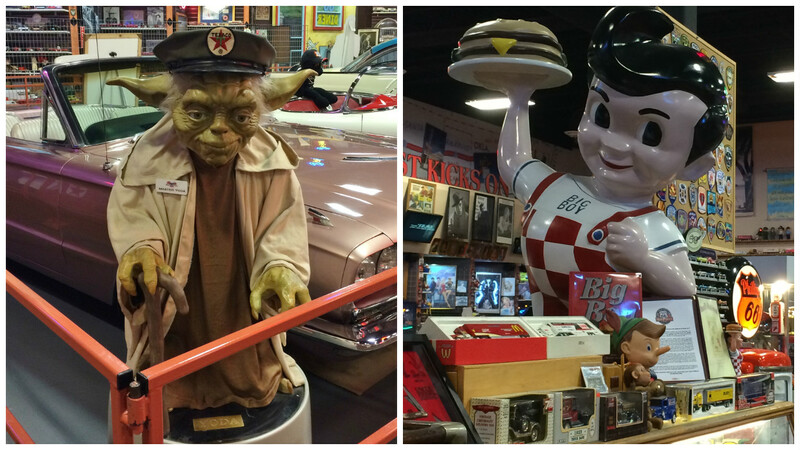 She also checks out Roadside America for the oddities. This gives us an idea of how long we need to stay in the area. 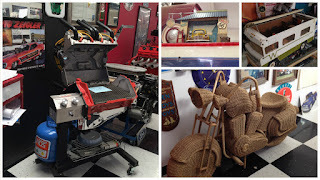 Local visitor centers have a wealth of information and if you ask the person working there what their favorite places are you get a whole new spin on things. We also ask the campground owners, waitress, cashiers etc and find out about things that aren't always listed else where. 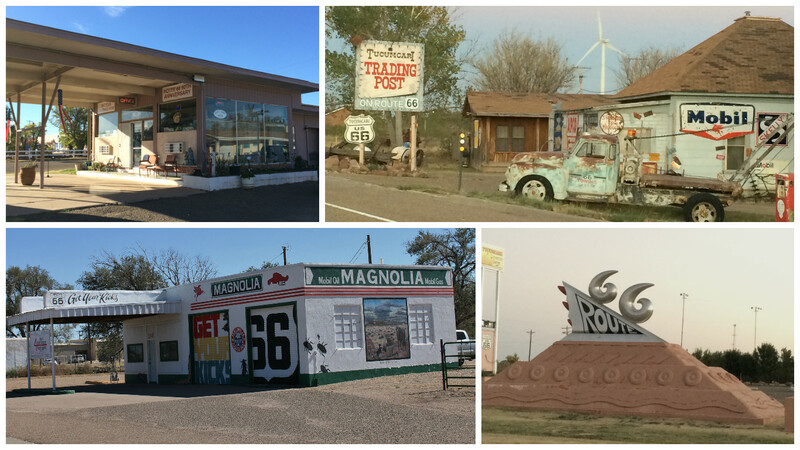 Since we have been on Route 66, it has been a little easier as we are using the Moon, Route 66 Road Trip Book. There are a number of books on the route to choose from. We have found this to be a valuable resource. So, what adventure are you going on next, near or far?